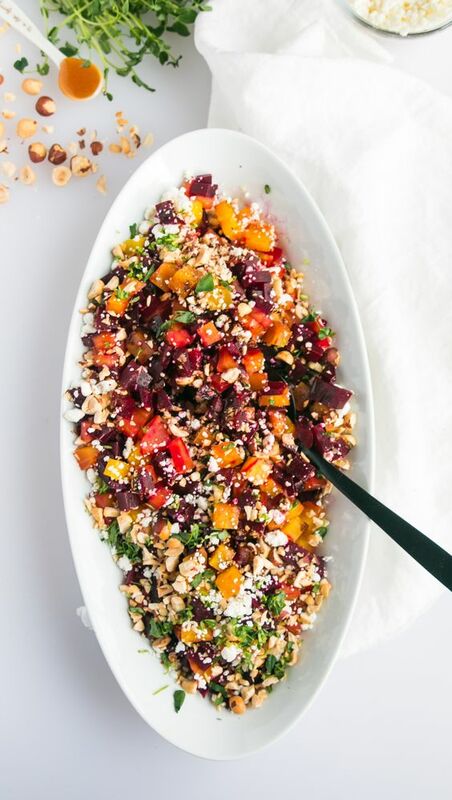 I have been wanting to share this nutritional beet salad with goat cheese for a while now. This beet salad is full of healthy benefits. Low in calories, and could help you improve digestion system. Beets are delicious and versatile vegetable that is easy to add to your diet. Good source of fiber - which is beneficial for digestive health and help with weight loss. Contain nitrates - because of the high concentration of nitrates in beets, they can help lower blood pressure, which may lead to reduce risk of heart attacks, stroke and heart failure. Golden beets are a little on the sweeter than the red beets. Golden beets do not have as much of that “earthy” flavor than red beets do, so it does make a difference in taste in recipes. Unlike red beets, golden beets don’t stain as much. As far as I know and have read, there isn’t one variety of beet that is healthier than the other. Boil beets for 1 1/2 hours. Take them out, and cool them down. Peel beets, and chop into cube size. Add to beets, goat cheese. On a small skillet, on medium heat toast hazelnuts. Add to beets. Boil beets for 1 1/2 hours. Take out, and cool them down. Peel beets, and chop into cube size.